If you're visiting Phoenix and like to go for a fitness walk or run at sunrise or sunset or just want to be sure to catch some of these spectacular shows of nature, it's helpful to know when the sun will come up and go down while you're visiting the Valley of the Sun. In the table below you'll find some general information about sunrise and sunset times in the Phoenix area. These are approximate averages for the month based on historical records. You can find the precise time the sun will come up and go down every day at TimeandDate.com. or on a weather app on your cellphone. Phoenix residents bask in comparably mild winters with about 10 hours of daylight hours each day and intensely hot summers with about 14 hours a day on the longest days of summer. In June, for instance, it will be light enough to start walking the dog at around 5:30 in the morning, before the concrete gets hot, but if you walk the pooch in the evening, you might want to wait until about 7:30 p.m. when the sun is setting and the hottest part of the day has ended. 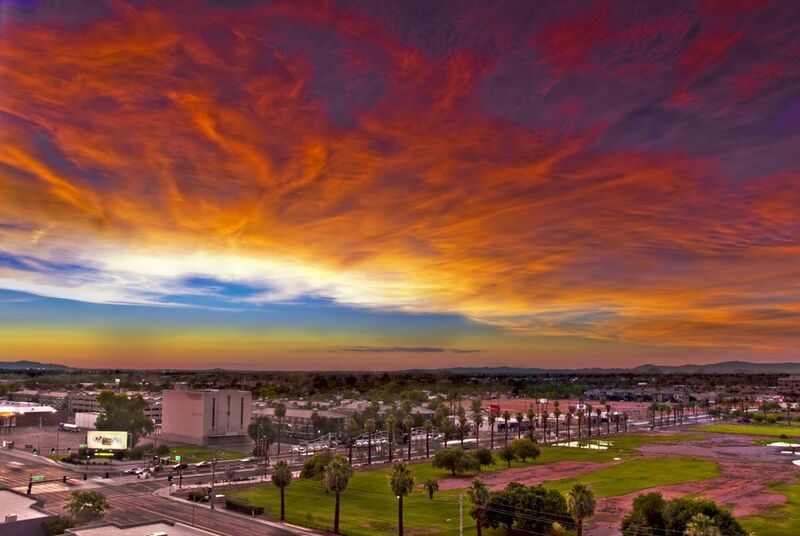 There are a number of great vantage points around Phoenix to relax and enjoy the multicolored Arizona sunsets and sunrises. According to the Phoenix New Times, though, the best place in the city to catch the sunrise is at Phoenix Mountains Preserve. Located just 20 minutes north of Downtown Phoenix (but still in the city limits), the Phoenix Mountains Preserve feels as remote as the Sedona desert while being surrounded by civilization, and it offers some of the best views of the city, especially as the early morning light begins to illuminate the valley. Phoenix New Times advises that you stick to the south side of the mountain for a less strenuous hike and the best views of the sunrises over the valley. South Mountain Park offers another great vista of the city at both sunrise and sunset, but you'll need to reach the summit of this mountainous park to get the best views. With hiking trails, picnic areas, and a number of other facilities and adventures awaiting you at South Mountain Park, you could spend the whole day—from capturing beautiful sunrise photos to watching the last rays of light leave the valley—up on this nature preserve.